It’s just over a month since the Dana Waranara Indigenous-led dance conference. I’m sitting in a hotel room on 7th Avenue in New York, and there’s a faint smell of smoked salmon permeating my room. It’s an intense minus three outside and BOM says it’s 40 plus in Melbourne. I’m lucky/privileged to be in New York, seeing shows at three experimental arts festivals that happen at this time each year, and attending a couple of conferences. All are rich and wonderful experiences, offering a chance to catch up with colleagues and dear friends from across the globe and exchange confidences, passions and map out the challenges ahead. On my first day here Catherine Jones (Arts House General Manager) and I share a large American brunch with contemporary artist Emily Johnson, originally from Alaska, of Yup’ik descent, now a New Yorker, and Meredith Boggia, her producer. 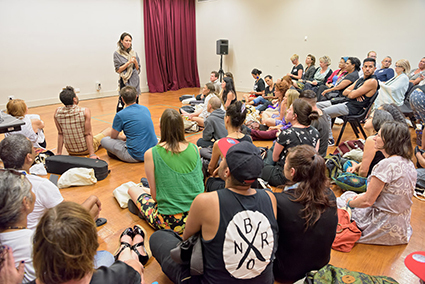 We continue the conversation that began at Dana Waranara, to bring her work, Shore, to Melbourne to be part of newly appointed artistic director Jacob Boehme’s Melbourne Indigenous Arts Festival in May 2017 and to develop a second work for 2019. Jacob, also part of Dana Waranara, and I had an excitable exchange the day before I left for New York where we quickly established our joint keen interest in bringing Emily to Australia to make work and a shared sense of how her work could generate a whole set of connections and methodologies in the Melbourne context that could be incredibly valuable for blakfellas and gubbas alike. Both projects are complex, deeply embedded in different communities—in Emily’s culture, in her expanded choreographic practice and in her deep desire to connect with the Indigenous artists and communities in Australia. It’ll take a lot to make it a reality. Around the table, over eggs-over-easy and a side of delicious brussells sprouts with peanut sauce (who’d have thought that could work? ), we all make long term commitments of time and resources… it’s clear this will happen and we will all do whatever it takes. It’s an easy conversation that moves from logistics to methodology, to the delights of naming artists, communities and elders we know and imagine will connect deeply with this project, and the things we think we need to be wary of. Where does this kind of clarity and trust come from? In my experience it usually takes years to get this point with an artist or a friend, but for me Dana Waranara opened a door into a way of thinking about how I, as a presenter/producer could move into a place of real experimental collaboration with Indigenous artists in Australia and around the globe, by shifting my presenting methodologies and moving towards and co-creating a place of possibility that doesn’t look like anything I already know or have seen, rather than waiting for it to appear fully formed out of the blue, out of some misguided (lazy?) sense that it was not my place to partner. Over the four days of Dana Waranara I learnt more about Indigenous arts practices, ancient and new, contemporary politics, the deep resilience, courage, brilliance, humour and tragedy that was shared by all the artists, who proudly, angrily, tenderly and generously shared stories of their histories, their land, their people. I learnt that many of these artists who were making such diverse, rigorous, deeply researched work, were making it in personal and family circumstances that were so challenging that I was left breathless and in awe of their commitment to their practice as artists and to their culture. Emily Johnson was one of three international artists, all of whom were welcomed and embraced by the Aboriginal and Torres Strait Island artists and presenters. Together we were strengthened in finding shared experiences of and responses to the colonisation of land, to the trauma of continued and continual discrimination, and the strategies for fighting back, for being proud, for feeling love. It was this connection that seemed particularly powerful to me: seeing ourselves and our situation from another, but similar perspective is an incredibly valuable insight, a place of comparison that is energising politically, emotionally and spiritually. And connecting. So when I fly 20 hours in a metal tube across the planet, I am filled with deep gratitude that, when I land, I am gifted some smoked salmon—prepared by Emily and her family—caught in the rivers, smoked in the fires of Alaska. A precious morsel, that holds nutrition in every way. So that’s some of what Dana Waranara gave to me… a gift made possible by a great leader in the making, Merindah Donnelly, who forged a hugely critical cultural space for those few days, which having been a part of will never leave me… and I believe has irrevocably changed us all. See also responses to Dana Waranara from Vicki Van Hout, Liza-Mare Syron and Andrea James commissioned by BlakDance.